I visited Magpies when I was in Knoxville of the holiday break. It was an easy-to-find location, and apparently is a new location for the bakery that has been around for a number of years. I actually expected to see more than cupcakes on display. 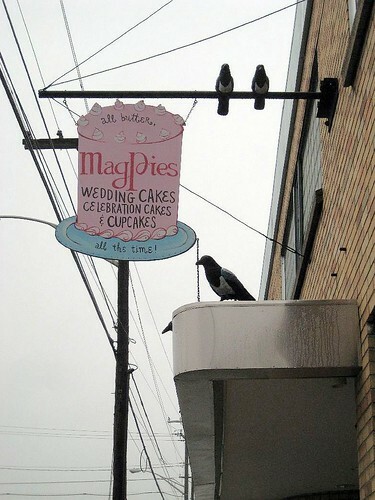 I’d heard of Magpies before, but thought it was more of a traditional bakery. When I arrived expecting some great pastry action for breakfast, I’ll admit that I was mildly disappointed. Cupcakes are great, but not exactly what I want for breakfast (I know some people’s opinions differ on the matter, but… my blog). I would like to point out the nearly flawless cream cheese frosting, which completely covers the cupcake. I’m a big fan of that. And the walnut pieces just hanging in the balance really finishes off the whole effect. 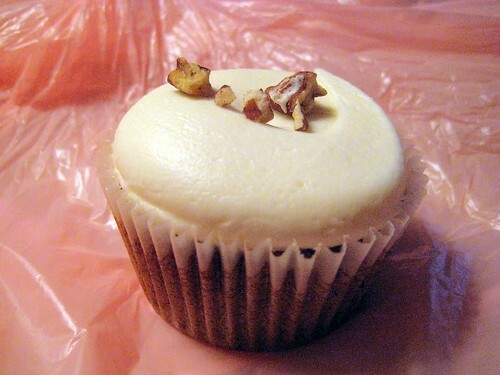 And the cupcake was dense, the cream cheese frosting lightly tangy…. yum! Vanilla – pretty classic, and pretty good. Mango – not for me. Too weird and fake tasting. But, I don’t really like mango anyways. Chocolate – tasty. Rich. Good times! But, nothing spectacularly out of this world, either. Strawberry – very sweet. Definitely not “real”. Again, not for me, even though I like strawberries. Mocha – the same chocolate cake as before, but with EXCELLENT coffee flavoured buttercream. Unfortunately, the “coffee bean” on top was not a coffee bean at all, more of a chocolate nib. A bit disappointing, really! Red velvet – beautiful, but mine are better! So, Magpies is pretty great, I’m not gonna lie. Some flavours weren’t for me, and that’s just the simple fact of that. Some people wouldn’t dig the mocha, or the red velvet (though I don’t know why). Still, have a look at their website, and if you’re ever in Knoxville, get up there! Maybe you’ll even get a few freebies like me! We’re so glad you came in to MagPies. We do concentrate on cake and cupcakes, although we did try our hand at offering everything for awhile. It’s funny that the mango and strawberry didn’t taste “real” to you since we use mango puree and strawberry puree for the icings. Nothing artificial, just pureed fruit and sugar. Oh well. We are glad that you were happy with our cupcakes overall, and hope that you’ll stop in again the next time you’re in town. I had a feeling you used mango and strawberry puree… I’d be highly disappointed if you used extracts/flavourings. I don’t know why those flavours didn’t appeal to me. As I said, I’m not a mango fan. 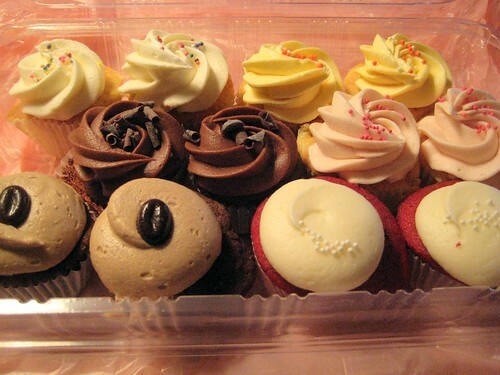 I’m sure devouring an entire assortment of cupcakes single-handedly didn’t help! =) Totally worth it though! I really appreciate the comment you left, and had a *GREAT* time at Magpies. I’ll likely be coming back to Knoxville at least once a year, and every time I will come in! Congrats on the new space, too! It’s very nice, and extremely easy to find. Good luck!